Poor A.J., he’s had a rough couple of days. Yesterday was his first trip to the groomer. The first groomer I called never called back, so I chose this particular groomer in part because they’re nearby, but also because according to their website the owner had a dog who did therapy dog work and I was hoping to talk to her about it. Our appointment was at 8:00 AM, so we had to get up early. We were up a little after 6:00, and took a little shorter walk than usual since I was sure the stress at the groomers was going to get him pretty tired out. The only person there when I arrived was Jenny, and she was very nice. We talked about A.J. and what kind of haircut he was going to get. She told me they’d be happy to recommend trainers and would get me some info when I came to pick him up. The groomers called around 10:30 and told me A.J. was ready to go home, but that they’d found an abscess on his paw and he would probably need to go to the vet. They mentioned some kind of grass I’d never heard of. I arrived at the groomers’, and A.J. looked like a completely different dog. I said I wanted him trimmed up and lower grooming maintenance. They asked if I wanted “the spaniel cut.” I had no idea what that meant, but assumed they knew about Springer Spaniels and said “Sure.” Well, they shaved him, head to toe. Even his poor whiskers were gone! I miss some of his shagginess, but he’ll be easier to take care of like this. They said he’s been a good boy and they hadn’t had any trouble with him. Then they showed me his paw. They pressed on the abscess and puss came oozing out. Yuck. So I brought A.J. home and immediately called the vet. This was at 11:00 AM. We got an appointment for 2:30. (Before we left the groomer we did get info on a trainer. I decided to wait to call until we find out how A.J.’s paw is.) At the groomer they kept talking about something that sounded like “cheat grass.” I grew up in a wetter climate where we didn’t have anything like that, so I’d never heard of it. Having grown up in this type of dry climate I asked Greg about it, and sure enough, they were saying “cheatgrass.” Apparently it’s a horrible grassy plant that has little barbed seeds that are made to get stuck on anything they touch. I started researching and found out it’s a pretty common problem for dogs. These seeds get stuck in paws and ears all the time. They can even get into eyes and noses, and work their way into lungs and muscle tissue. Nasty stuff. I’m learning all sorts of things since moving to Idaho. First tack weed (aka goat heads, puncture vine) keeps puncturing our tires, now cheatgrass has crippled my dog. I’m not exactly thrilled with Idaho vegetation right now. We went to the vet at 2:30. They said they’d have to dig into the paw. He’d be sedated but awake, so they weren’t doing a general anesthesia, which is good. First they told me to go home and come back at 5:30. Then they told me it would only take about half an hour for the procedure, then I could sit with him while he woke up. This was at 3:00, so I decided to stay. I went and got gelato at the candy store down the street, then sat in the waiting room until they brought A.J. out at 5:15. Apparently I should have just gone home. Greg came to keep me company around 4:30. Before that I had some nice conversations with people in the waiting room who were piling up because A.J. was taking so much time. They didn’t find any cheatgrass in his paw, even though they made a giant incision in the top of his paw to try to find it. They did, however, find one deep down in his ear. Poor little guy, we had no idea that was in there. He was still pretty drugged when we got home. He mostly slept for the next few hours. I had to wake him up and seriously bribe him to get him to take his medicine. I also had to try to put a sock on his paw because it was oozing everywhere. He started to really wake up around 10:00 PM. It was obvious the local was wearing off because he didn’t like me messing with the sock. Greg had to hold him still while I tried to secure the sock. A.J. was wide awake at 4:00 AM. Greg sent him out, he came right back in. About 10 minutes later I went out with him, he laid down so we came back in. He wouldn’t settled down, so I finally took him out to the living room. I thought he might be hungry because he hadn’t eaten dinner, and I was right, he ate what was left in his bowl. He still didn’t settle down, and the sock kept falling off. When it did, he kept licking at his foot. I kept trying to put the sock back on. He finally got mad and growled at me. I growled back and got the sock on. We fought over that sock most of the early morning. He finally settled down around 5:30 or so and I slept a little, but I kept waking up to check on him. He was up for good again by 7:00. I took him for a short walk at 7:30. He ate breakfast when we got back. We still had some sock issues and I planned on calling the vet to get a cone of shame. But I finally decided to try one more time. With Greg’s help I put on a new sock and taped it on with masking tape. It seems to be working, A.J. ran around the yard for a little while and I only needed to retape once. He’s been sleeping most of the afternoon. Hopefully I made the right decision on not getting the cone or tonight’s going to be another long one. Greg watched over A.J. for almost two hours while I shut myself in the bedroom and took a nap. Poor little guy, he’s as beat as I am. Yesterday was a really rough day. A.J. 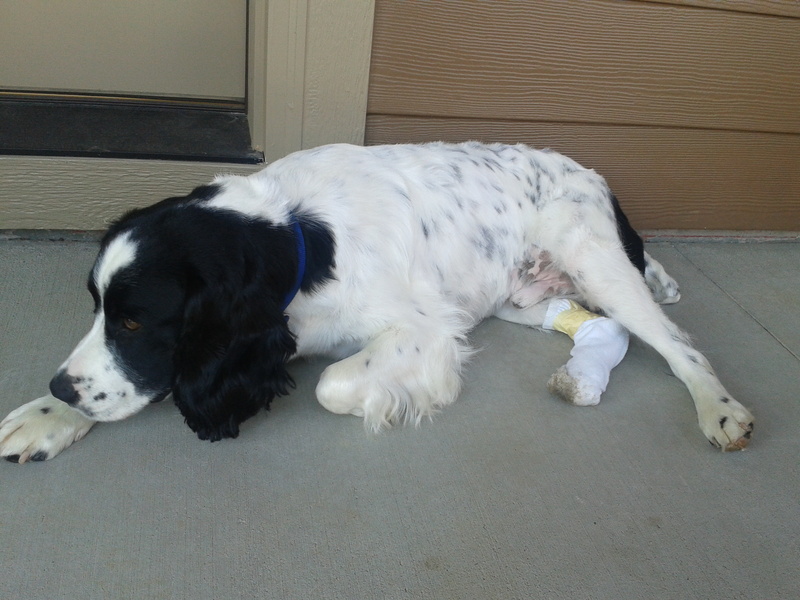 with a new haircut, and a sock to protect a cheatgrass wound.